Working people spend a lot of time in conference rooms. It’s where teachers gather weekly to plan classes, businesses hold frequent presentations, and committees schedule meetings. With all the important work people use them for, it’s important that the room promotes productivity. You can make the room ready for work by choosing the right conference room furniture, arranging it for optimum use, and keeping the room organized and prepared. Furniture that promotes productivity in your room depends on several factors. The size of the room is one of the bigger considerations. Conference rooms that are stuffed with oversized chairs that don’t allow any movement around them will impede collaboration. It also looks too intimidating and busy for presentations. Slim executive chairs with wheels, like the Eco Leather Chair, add simple design and flexibility to freely move around the room as needed. The type of business you run also dictates what kind of conference furniture you need. New, up-and-coming businesses have leaned toward offices with a modern design, featuring sleek, unadorned furniture that is raised off the floor to give an open feel to the room. Contemporary conference tables, like the Glass Conference Room Table by OFM and the Boat Shape Conference Table w/ Elliptical Base by NDI, will add that clean and contemporary look. Businesses that have a more traditional office space design, however, will want a traditional conference table to match, like the Townsend Series Conference Table by OFD. Keep in mind the normal use of the room as well. The use of some conference rooms might indicate that your furniture be formal to insure that it looks nice to outsiders or it might need to feel informal to encourage collaboration. Whatever factors your conference room requires, it is very important to make sure your furniture is comfortable to spend a lot of time in. Comfortable people are productive people. It is important to arrange the furniture in a way that makes it accessible and easy to use. The way you arrange your conference room furniture depends on what the room is being used for. 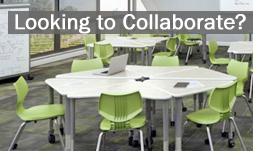 If you do a lot of collaboration, you will want to make sure that furniture is flexible to move around and people are able to face each other and talk comfortably. This may call for a smaller table so no one is shouting across the room. If you do a lot of presentations, you might want to arrange the furniture to face the presenter instead of each other. Above all, make sure people have the elbow room to do what they need to. It’s hard to be productive if all your material can easily get mixed up with someone else’s. Parenting magazines suggest that parents have all the necessary equipment ready and in one spot when encouraging kids to do their homework. The same principle applies to conference rooms. Make sure there are plenty of storage cabinets and shelving units in the conference room that are full of pencils, paper and other necessary supplies at all times. Take inventory of your supplies every week to keep you prepared and organized. It’s helpful to keep supplies stored near the tables or desks. That way, no one wastes time hunting for things they need. It also might be helpful to have a coffee maker or mini fridge in the conference room to encourage people to stay concentrated, instead of taking trips to the soda machine or fretting about what time they will have lunch. If you set up your conference room in a way that is conducive to productivity and keep it stocked with your needs, you will get the best use out of it. If you want help in achieving these goals, contact us and we’ll be glad to oblige. Amazing & Stylish furniture design for classroom. Thanks for sharing this blog!